Safely Save a Toothbrush - Where do you keep a toothbrush? The bathroom sink? Actually there is nothing wrong with putting a toothbrush in the sink. However, if the sink adjacent to the toilet, it is becoming a problem. According to biologist University of Arizona, United States, there are approximately 3.2 million bacteria per 2.5 cm2 toilet. Wow! When you pour water into the toilet, then the spurt of air that will carry up to 1.8 meters into the surrounding area. That is, the floor, the sink and brush your teeth any material can be contaminated with bacteria. 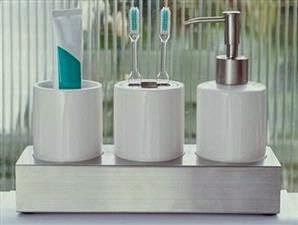 Want to keep the toothbrush is always clean? The trick, wash with running water before use and store in a closet or medicine cabinet behind the bathroom mirror.